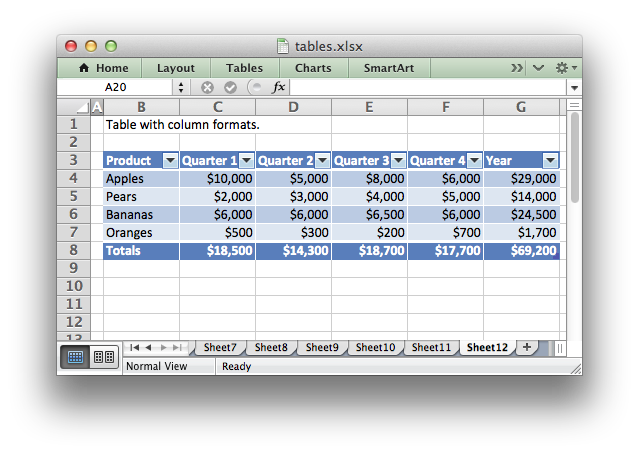 Example of how to add tables to an XlsxWriter worksheet. Tables in Excel are used to group rows and columns of data into a single structure that can be referenced in a formula or formatted collectively. See also Working with Worksheet Tables. # Example of how to add tables to an XlsxWriter worksheet. # structure that can be referenced in a formula or formatted collectively. # Some sample data for the table. # Set the columns widths. # Add a table to the worksheet. # Table data can also be written separately, as an array or individual cells. # Formula to use in the table. # Options to use in the table.